Good morning crafty friends. What a dull day we are having I hope you are all fit and well. This is a Suger Nellie stamp I have used for this card I followed a colouring tutorial for the dungerees and I am very happy with the results. I wanted to keep the card quite simple to show of this beautiful image. I hope you like it. 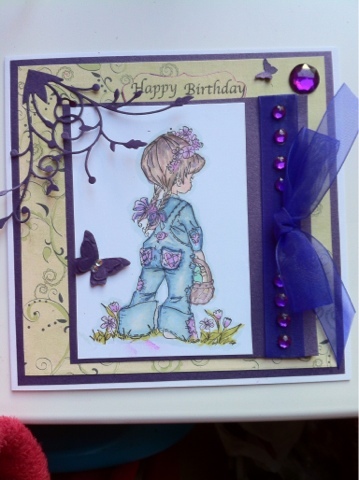 beautiful - the dungarees look fab - and you know that I just love that die cut swirl!! Gorgeous card Lyn, the image is adorable, I like the paper, the corner and the big bow. Georgeous card and fab image. I love sugar nellies. I loved my visit with you..enjoyed your sweet little ones..and your beautiful art cards and notions..look forward to walking with you along the journey of arts creativity.